Benjamin Fiala lost 38 lbs. with P90X3, Shakeology, and the Beachbody Performance supplements. He entered his results into the Beachbody Challenge, and won the $500 Daily Prize for October 6th! I was a former college athlete who got a desk job and gained a lot of weight quickly. Gaining all that weight really messed up my confidence. I did not like my body at all. I knew something had to change, so I decided to give P90X3 a try. My biggest challenges were lethargy and lack of motivation. 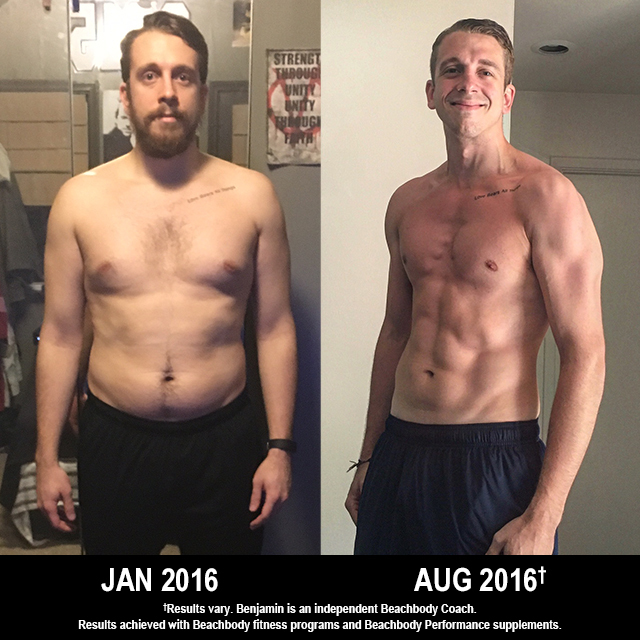 P90X3 helped me become disciplined and motivated. I really liked that it was only 30 minutes a day, and the workouts scale well with increase in ability. I lost nearly 40 lbs. and 15 percent body fat. I gained a tremendous amount of strength. I have never been more fit in my entire life. I am proud of all of those things. Shakeology and the post-workout formula played integral roles in helping me eat better and recover quicker.